JavaPipe Review 2019: Is JavaPipe a Good Hosting? 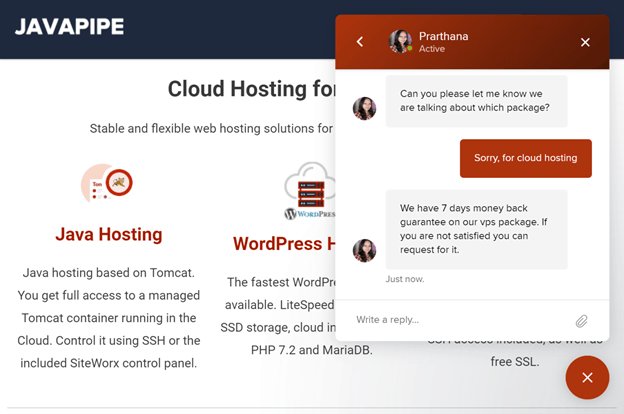 JavaPipe describes itself as offering “cloud hosting for developers” backed by “infrastructure for admins.” Put simply, this isn’t simple shared web hosting for beginners. JavaPipe was founded in 2001 and is headquartered in Salt Lake City, U.S.A. It has data centers in America and Europe that cater to thousands of global customers. The JavaPipe website is available in English. 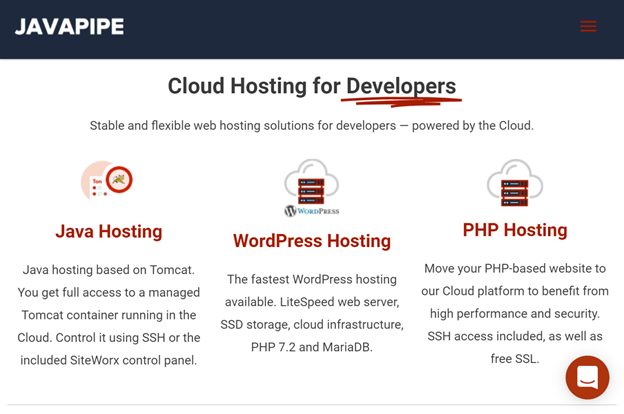 JavaPipe provides specialized Tomcat-based hosting for Java developers, plus PHP hosting, WordPress hosting, and VPS plans. This vendor’s use of cloud technologies allows it to offer an SLA-backed 99.5% uptime guarantee. The Java and PHP packages provide similar resource allocations across three hosting plans each, which start with 5 GB SSD storage, unlimited databases, and 200 GB monthly traffic. For Java hosting, each Tomcat instance is dedicated to one user (even though this is a shared hosting environment), and you can manage your Java hosting using SSH or the SiteWorx control panel. With the PHP hosting, you get free SSL, Cloudflare CDN support, spam filtering, and daily offsite backups. WordPress hosting features the LiteSpeed Web Server and comes “Cloudflare ready” for improved performance. The WordPress plans come with 1000 GB traffic, 20 GB SSD storage, and unlimited domains and databases. You also get free SSL certificates and either automated or manual daily backups, plus free website migration and optimization for one website. If you’ve been looking around for standard shared web hosting, you’ll be surprised by JavaPipe’s relatively high priced Java hosting plans. Although there is no free trial, you do get a 30-day money-back guarantee with the Java/WordPress plans and a 7-day money-back guarantee with the VPS plans. Therefore, you have some time to decide if this hosting vendor really is the one for you. Available billing cycles are monthly, quarterly, semi-annual, annual, biennial, and triennial. By committing to a three-year term you can save up to 40%, and you can pay by PayPal, credit cards or Bitcoin. As the name suggests, JavaPipe focuses mainly on providing hosting for Java developers on Tomcat servers. These Java hosting plans are complemented by WordPress and VPS plans. If you’re looking for simple shared hosting, you should probably be looking somewhere else. Wondering how JavaPipe stacks up against other Web Hosting companies? Enter any other Web Hosting company and we will give you a side-by-side comparison.